Odysseas Papadimitriou’s real estate practice focuses on commercial real estate and land development including acquisitions, dispositions, real property financing, commercial leasing, and condominium development. Odysseas has also developed a particular expertise in condominium law. He represents and advises developers, condominium corporations, and condominium lenders on a variety of issues including condominium governance, reciprocal agreements, dispute resolution, lien enforcement, management and operation, and third-party contracts. 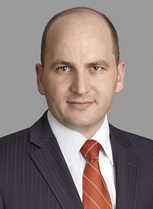 Odysseas received his Juris Doctorate from Osgoode Hall Law School in 2010. While at law school, Odysseas served as a senior case manager with the Osgoode Hall Business Clinic, volunteered with the Artist Legal Advice Services, and served as President of the Hellenic-Canadian Law Students Association—Osgoode Chapter. Prior to attending law school, Odysseas obtained an Honours Bachelor of Arts in philosophy from York University. November 2016 – MacDonald v. Chicago Title: A New Definition of Marketability – Law Society of Upper Canada. May 2016 – Tactical Primer on Mixed-Use Developments – Client Presentation. April 2016 – Amendments to the Condominium Act – Hellenic Canadian Lawyers Association/Italian Canadian Lawyers Association. November 2015 – “Amendments to the Condominium Act – A Paradigm Shift” – Law Society of Upper Canada. June 2015 – “Condo Rules: Tips and Traps for Real Estate Lawyers” – Ontario Bar Association Program. November 2014 – “Arrested Development: Professional Obligations regarding Trust Accounts” – Law Society of Upper Canada. November 2012 – “Everything You Ever Wanted to Know about Condos But Were Afraid to Ask” – Ontario Bar Association Program.